DESCRIPTION: IWS nears completion of its $2.6mm Design-Build contract with Kennedy Wilson (www.kennedywilson.com) for the permitting, design, and construction of a wastewater treatment and dispersal system to service a remodeled high end retail complex on Pacific Coast Highway in Malibu, CA. IWS nears completion of its $2.6mm Design-Build contract with Kennedy Wilson (www.kennedywilson.com) for the permitting, design, and construction of a wastewater treatment and dispersal system to service a remodeled high end retail complex on Pacific Coast Highway in Malibu, CA. Due to the premium cost of real estate, the wastewater treatment system and related components were located below grade in the parking lot, which includes the treatment system, tanks, dispersal, and odor control system. IWS teamed with EPD Consultants, Inc. (EPD), a local engineering firm with extensive experience in designing onsite wastewater treatment systems and permitting projects in Malibu. IWS completed the initial Regional Water Quality Control Board Los Angeles Permit Application for the former owner of the project. After Kennedy Wilson acquired the property, the IWS team was selected to execute the project on a Design-Build basis. IWS collaborated with EPD in the design phase and provided constructability review and value engineering recommendations to provide the client best value while meeting the regulatory requirements. The system design included grease interceptor tanks, equalization tanks, a packaged treatment system, odor control system, and subsurface dispersal in a pressure dosed leachfield, with all components below grade. An iterative design process was required to accommodate the leachfield sizing, placement of the grease tanks and equalization tanks, maintaining set-backs from utilities and adjacent buildings. In addition, the wastewater permit was fast-tracked with the city to accommodate the buildout of the retail center. After the permit was received and construction of the onsite treatment system began, IWS and EPD continued to work with the owner to accommodate their building specific permitting requirements and indirect impact to the treatment system design. Through a collaboration with IWS, EPD, and the owner’s rep and team members the project has moved forward to construction. The main feature of the project is the ECOfluid Systems Inc. (ECOfluid) Upflow Sludge Blanket Filtration (USBF) technology which was designed to treat the high BOD strength wastewater from the retail centers restaurants and mixed use tenants. 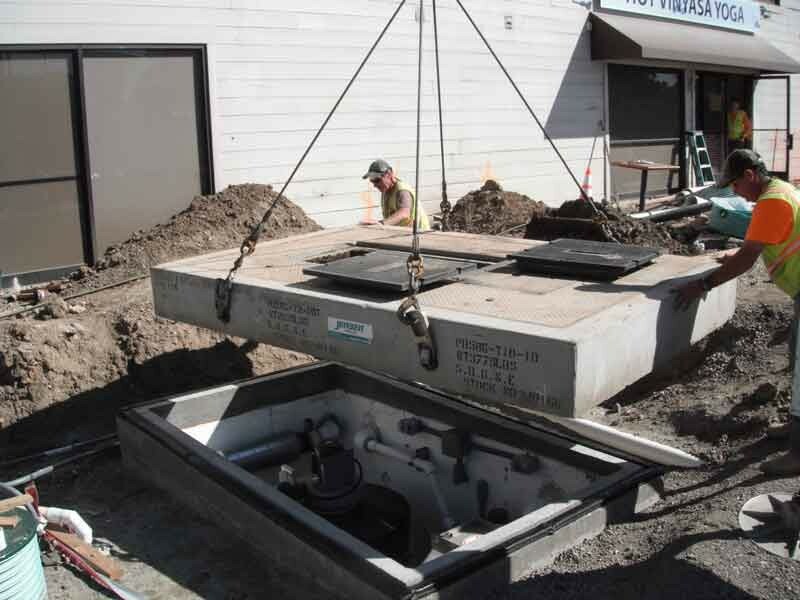 The system was design to be placed below grade and has H20 rated hatches that are cast in place on the parking lot surface. The treatment system blowers and controls are housed in a sound proof CMU block building at the rear of the property. The odor control units are housed in below grade vaults. Other components of the treatment system included 10 precast concrete tanks of varying sizes (www.jensenprecast.com), three odor control units (www.purafil.com), and UV disinfection units (www.aquaazul.com). The existing pressure dosed leach field under the parking lot was completely excavated and replaced with spec sand, drain rock, and perforated leach lines.